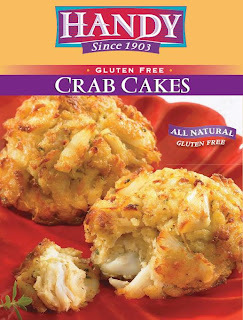 Handy launched its newest product, a gluten-free crab cake, at the 2010 International Boston Seafood Show. The all-natural crab cakes are formed by hand, made with a rice flour breading. Each patty contains fresh crab meat, mayonnaise, rice flour, eggs, mustard, seasonings and parsley. The company tests every batch for gluten in the manufacturing process, using a threshold of less than 10 parts per million. In 1917, Maryland-based Handy established itself as a soft shell crab processor, making it the oldest soft shell crab company in the world. Packages of the gluten-free crab cakes, two per box, can be purchased locally at ShopRite supermarkets for $7.99 each.